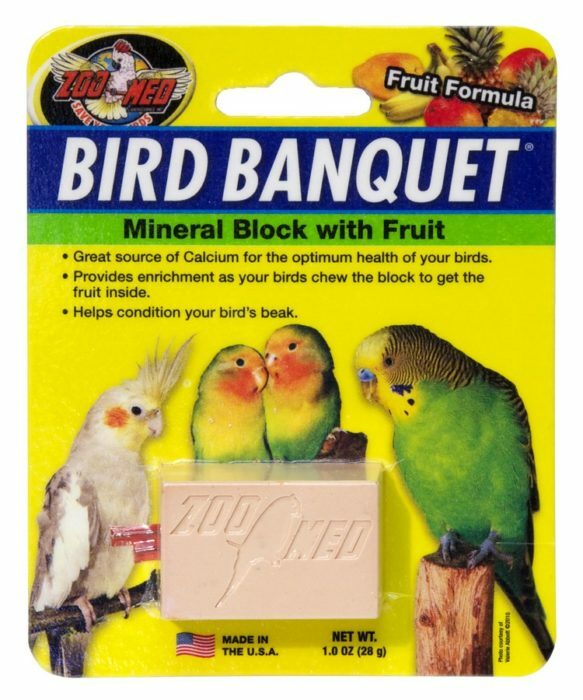 Bird Banquet® – Fruit Formula | Zoo Med Laboratories, Inc. 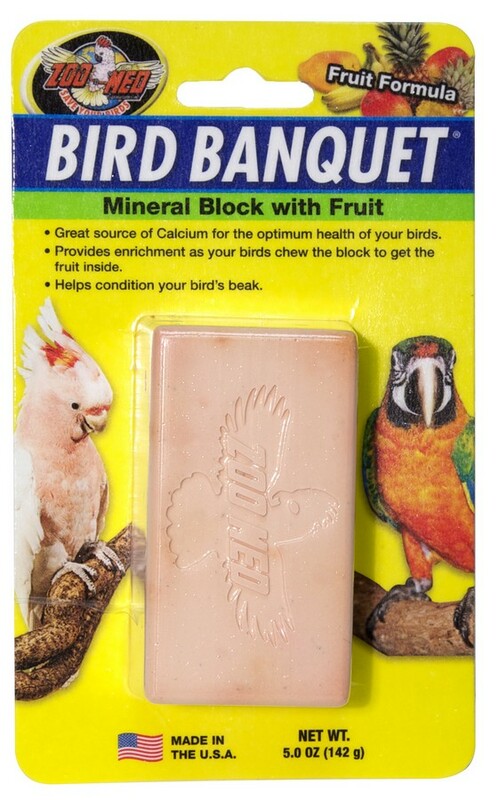 Zoo Med’s Fruit Formula Bird Banquet® is designed to add necessary digestible calcium to your bird’s diet while also helping to keep your bird’s beak trimmed and thus helping to prevent overgrowth. This formula includes a mixture of nutritious fruits (Mango, Banana, Papaya, and Pineapple) in a solid Calcium base. Provides enrichment your birds chew the block to get the seeds inside. Added Fruits: Mango, Banana, Papaya, & Pineapple. Calcium Sulfate, Dried Mango, Dried Banana, Dried Papaya, Dried Pineapple, Ground Oyster Shell, Salt, Silicon Dioxide, Ground Limestone, Sugar, Dicalcium Phosphate, Niacin, L-Ascorbyl-2-Polyphosphate (source of vitamin C), Thiamine Hydrochloride, d-Calcium Pantothenate, Pyridoxine Hydrochloride, Biotin, Beta-carotene, Iron Oxide, Manganese Phosphate, Manganous Oxide, Copper Carbonate, Diiodosalicylic Acid, Zinc Carbonate, Propylene Glycol, Cobalt Carbonate, Sulfur Dioxide (preservative), Artificial Tropical Fruit Flavor, Red 40.